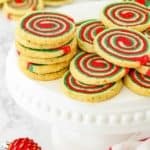 These Eggless Icebox Christmas Pinwheel Cookies are our family’s new favorite Christmas cookie recipe! They’re crisp and buttery, and so fun to make. Great for gifting or leaving out for Santa. Stir together flour, and baking powder in a bowl. Beat together butter, granulated sugar, cream cheese, and salt in a large bowl with an electric mixer at medium-high speed until pale and fluffy, about 5 minutes. Add vanilla extract and beat until incorporated. Reduce speed of the electric mixer to low and add flour mixture in 3 batches, mixing until dough just comes together in clumps. Place dough on a lightly floured surface. Gather and press dough together with your hands. Then divide into 3 equal pieces (326 gr each piece). Shape one piece of the dough into a disk and wrap it securely in plastic wrap. This will be the white layer. Return one of the pieces of dough to a mixing bowl, and with the mixer on "low," add in the red food coloring until it reaches your desired color. Remove from bowl, shape into a disk and wrap it securely in plastic wrap. Add the final piece of dough to a mixing bowl, and with the mixer on "low," add in the green food coloring until it reaches your desired color. Remove from bowl, shape into a disk and wrap it securely in plastic wrap. Refrigerate all 3 disks for 1 hour. Remove the dough from the fridge. On a lightly floured surface roll out each disk into a 4 x 6 inches rectangle. Starting with the white dough as the base, stack the rectangles on top of one another. Run the rolling pin over the stack a few times to make sure everything is even. Then keep rolling to create a rectangle of 13 x 10 inches. Starting from the long side, roll up the dough stack tightly to create a log. Cut the log into 3 pieces. Roll each log in coarse sugar, coating it evenly, if desired. Wrap logs with plastic wrap. Refrigerate for at least 2 hours up to a month. Position two oven racks, evenly spaced, in the middle of the oven. Preheat the oven to 350º F (180º C) and line two baking sheets with parchment paper. Using a sharp knife, cut the log into ¼ inch thick slices. Arrange slices on the prepared baking sheets, spacing them evenly. Keep the remaining logs in the refrigerator until the first batch bakes. Bake for 13 – 14 minutes, or until slightly puffy and the edges look set. Let them cool in the baking sheets for 5 minutes and then transfer cookies to a wire rack to cool completely. Let the baking sheets to cool and then bake the remaining cookies. Basic Icebox Cookie dough: Follow the recipe up to step 5. Form dough into an 8-inch-long log; wrap tightly in plastic and freeze until firm, 30 minutes (or up to 1 month). Then slice and bake as instructed. Mix-ins:to the basic icebox dough you can add any mix-ins of your liking, such as chopped nuts, dried fruit, chocolate, citrus zest, etc… Read above for more ideas. Make Ahead: You can refrigerate the cookie dough for up to 1 month before slicing. Store: Cookies stay fresh in an airtight container at room temperature for up to 1 week.